For the 15th year in a row, Opportunity and the Mars Exploration Rovers (MER) mission drove into the spotlight during an afternoon session at the 49th Lunar & Planetary Science Conference (LPSC), held in The Woodlands, Texas, in March. Known by its acronym, LPSC is where this niche of the space community regularly communes and where this MER-class robot field geologist is treated with reverence worthy of a veteran. Drawing scientists, professors, and students from around the world, this annual conference is where the latest, greatest research in planetary science is presented and the craziest, most far-reaching, thoughtful theories flaunted. Under the banner Mars Rover Results I: Depositional and Environmental History, six scientists took to the podium on March 22nd to present Opportunity’s findings in Perseverance Valley so far, as well as their analyses and the evolving thinking about the strangely unique formation that defines Endeavour’s west rim at Cape Byron. Although the MER presentations followed six talks on Curiosity’s recent findings, Opportunity’s starbot power and the science delivered kept the room filled to the end. By the time the session was over, they succeeded in leaving the audience in a cloud of metaphorical dust, rapt in the fog of another Martian mystery. Opportunity has been exploring the western rim segments of the 22-kilometer (13.7-mile) diameter Endeavour Crater since August 2011, racking up some 12 kilometers—more than 7 miles—climbing, driving, and sliding around, in, and through several of them. With Perseverance however, the robot is blazing another new trail into ancient Mars, charting Earth’s first on-site look at a feature that from orbit looks like it was carved by water flowing downhill. The objective is straightforward: study the valley’s morphology or shape and its compositions, and determine how, and if possible approximately when, it formed. Opportunity drove up to the west rim of Endeavour, a 22-kilometer (13.7 mile) diameter crater, at Cape York, in August 2011. After finding signs of past water and ancient clay minerals there, the robot field geologist roved on, and is currently in Cape Byron conducting the first-ever study of an ancient geological feature that from orbit looks like it was carved by water. The base image is a mosaic taken by the Malin Space Science Systems’ Context Camera on the Mars Reconnaissance Orbiter. Larry Crumpler, of the New Mexico Museum of Natural History & Science, provided the labeling. North is up. From the crater rim crest, or notch as it appears in images, Perseverance extends downhill at about a 15-degree angle for about 200 meters (about 219 yards) toward Endeavour’s interior. Along the way, it breaks into an anastomosing pattern or, in other words, it branches off in different directions that look like a river system. In the first images taken of it by the HiRISE camera onboard the Mars Reconnaissance Orbiter (MRO), this place screamed water. “That’s why we went there,” said MER Project Scientist Matt Golombek during a recent interview. Moreover, whatever first created this feature was generally thought to have occurred at some point during the ancient Martian epoch 4.1-to-3.7 billion years ago called the Noachian Period. That’s the timeframe when Mars is believed to have been wetter and more like Earth, with rivers, lakes, streams, and perhaps an ocean. Sometimes, however, impressions from orbit are not so easily, not so clearly confirmed when viewed up close by a robot field geologist. The MER scientists are scientists though and they assume nothing, as a rule. Long before Opportunity even pulled up to Perseverance in May 2016, the approach to researching this distinctive place was declared,decidedly unbiased and intentionally simple: “We’re going about this with multiple working hypotheses,” said MER Principal Investigator Steve Squyres, of Cornell University. That has been the mantra ever since. This orbital image was taken by the HiRISE camera on the Mars Reconnaissance Orbiter (MRO), which is overseen by Principal Investigator Alfred McEwen, a planetary geologist and Director of the Planetary Image Research Laboratory (PIRL) at the Lunar and Planetary Laboratory at the University of Arizona. You can see the notch in the crater rim in lower left quadrant of image, and the valley’s anastomosing or branching pattern becomes apparent in the center of the image. It’s an approach, geologically speaking, that is well traveled and long proven, as Rob Sullivan, a MER Athena science team member, also of Cornell, pointed out. The Method of Multiple Working Hypotheses, written by American geologist and educator Thomas Chrowder Chamberlin (1843-1928), was first published in 1890 in the journal Science. Chamberlin went on to found and edit the Journal of Geology, serve as President of the University of Wisconsin, President of the American Association Advancement of Science (AAAS), and a director of the Walker Museum at the University of Chicago. During the last 125 years, it has become a classic, published many times in different formats, and its principles guide and influence research integrity to this day. Toward the right side of this scene is a broad notch in the crest of the western rim of Endeavour Crater that looks like it might once have been a spillway. In the spring of 2017, Opportunity left tracks while checking out the top of Perseverance Valley, which descends out of sight from the notch. This scene includes troughs that may have been formed by water, wind, or faults caused by the impact that created Endeavour or something else. The objective is to determine what force or forces formed Perseverance. Opportunity is now halfway down Perseverance and Mars is still talking. Beyond the sometimes-slippery slopes of the gravelly terrain on which Opportunity is roving, the team’s challenge lies in the fact that Perseverance is the only geological feature of its kind at Endeavour. There is nothing anywhere else in the rim that looks anything like it. The valley’s “singularity” is “an outstanding characteristic,” Sullivan said. That’s the good news, right? The bad news? “This poses important challenges to all candidate origins, including water,” he said. So uniqueness is making the task of uncovering the story of Perseverance one of if not the greatest Martian mysteries that Opportunity and the MER science team have undertaken. Nevertheless, in tight, on-point presentations, the six lecturers of MER research at LPSC this year reviewed some solid geologic studies,laid out a number of key findings that reveal an evolution in the team’s thinking– and proved once again that there’s nothing quite like a good Martian mystery. “It’s a work in progress.” Steve Squyres cut to the chase. Then he launched the MER talks with a “high-speed” walkabout of the evidence the Athena science team members have found to date at Perseverance Valley and the implications that data may have for solving the mystery of what it was that created this unique geological feature. MER Principal Investigator Steve Squyres, of Cornell University (right), led off the MER talks at LPSC in March 2018 with a “high speed” review of the various discoveries that Opportunity has found during her road trip into Perseverance Valley (left). At the time of the conference, the rover was about halfway down the length of the valley. Click to enlarge map to see rover’s route through Sol 5000, mid-February 2018. Since last May, Opportunity and the team have been looking at all the features on the ground, as well as imaging the morphology. While they have found evidence that seemed to point to past water, they also uncovered other potential contributors to the original working hypotheses that would be detailed during the conference. 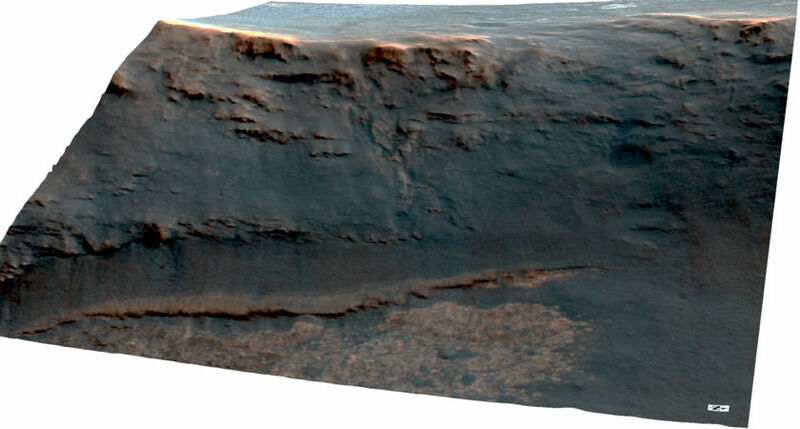 Once Opportunity got into the valley, the scientists found the topography to be “really very subtle,” Squyres said. “A lot of it is in-filled with soil.” The rover has also found plenty of visibly scoured outcrops. From troughs to stone stripes and scoured rocks, Opportunity has found all kinds of geological goodies in Perseverance. The Pancam team at Arizona State University (ASU) processed the image of the troughs (left) in false color, a technique scientists use to better discern the various geological elements in the scene. The troughs and the stone stripes (middle) remain enigmas for now, but the etched rock Mesilla (right), at the La Bajada site “really caught” the scientists’ attentions, because its “flow tails” indicate direction of erosional flow. “That direction,” said Squyres, “is uphill.” And that points to wind erosion, not water flow. In the troughs where the soil is, the scientists found “distinct linear arrangements less than one meter across,” Squyres said, what geologists refer to as stone stripes, “You can see these parallel ridges across and the ridges are composed of coarser grains with finer grains in them. We immediately think these could be some kind of periglacial features like the stone stripes found in a number of places on Earth where there is shallow subsurface ice, like on Mauna Kea [Hawaii]. But when you look at these things closer, it doesn’t hold together so well,” he said. Mike Mellon, a planetary geologist and geophysicistand associate research professor in the Applied Physics Laboratory at Johns Hopkins University, stepped in at MER Deputy Principal Investigator Ray Arvidson’s request to help with some thermal modeling. The objective was met. “The answer is no and no,” Squyres said. Members of the MER ops team worked together to help Opportunity celebrate her 5000th day on Mars by taking her first-ever selfie with her Microscopic Imager camera (left). About a week later, the team had the robot take an additional lower tier of pictures for the mosaic to include the rover’s right wheel. James Sorenson processed the image presented here. Don Davis colorized it using a realistic Mars palette. At LPSC, Steve Squyres gave a shout out to members of the ops team at JPL (right) who have helped make the MER mission possible. While the origin of Perseverance is still “a work in progress,” Squyres personally ruled out the dry avalanche theory. The downhill slopes are “too gentle,” at 15-degrees, and the rover has seen “no deposits of anything” indicating a past avalanche. That leaves water or fluvial transport, wind, and debris flow, as he viewed it, still among the multiple working hypotheses. There was more to come, more to go, and new observations about how planetary forces, like people, sometimes work together. On the first geologic traverse ever conducted by a rover within the rim of a large impact crater, Opportunity has driven approximately 12 kilometers (more than 7 miles) in the western segments of Endeavour. Along the way, Larry Crumpler has been studying the crater’s structure, as well as the rocks, outcrops, and troughs to understand how the structure “agrees with the actual physical characteristics” the rover is finding on the ground. In his talk, he laid out evidence that the west rim segments and Perseverance Valley are “strongly” controlled by faults and fault zones created at the time of impact. Larry Crumpler’s maps of the structure of Endeavour are providing evidence that its rim segments are probably controlled by faults caused by the impact that created the crater. As the rover descended into Perseverance Valley, he continued mapping and uncovered potential faults and fault zones. “I think increasingly we’re seeing the possibility that the valley is controlled by some sort of major fault,” he said. As Opportunity descended from the Cape Tribulation rim segment and roved to Perseverance, Crumpler studied geological characteristics documented in the images the rover sent home. “One of the large-scale characteristics is the segmentation of the crater rim,” he said. 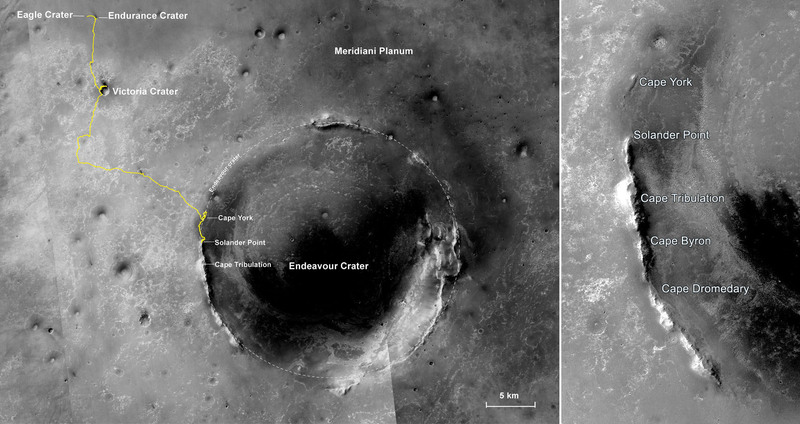 In the graphics above, Crumpler shows Opportunity’s route into Perseverance (left). “The important point is that we’ve mapped out these fractures or faults from La Bajada,” Crumpler said at LPSC. “Basically, they bound the margins of the south trough. The faults are the blue lines (right image) and our volcanic rocks and linear outcrop in the middle between them look suspiciously like fault zones.” The base for these graphics are orbital images taken by the HiRISE camera onboard MRO, which have been stretched vertically so scientists can better see the terrain. Different kinds of rocks near each other, and especially those with a sort of boundary between them, often indicate the presence of a fault to geologists. As Opportunity has descended the approximate 15-degee slope of Perseverance Valley, the rover has also found the juxtaposition of different rock types have aligned downhill. The strip of terrain that separates the outcrops of La Bajada – where bright, flat rocks on the northern side contrast with lumpy, darker rocks on the southern side, where Opportunity found the wind tails that point up hill – “looks suspiciously like some sort of fracture,” said Crumpler. 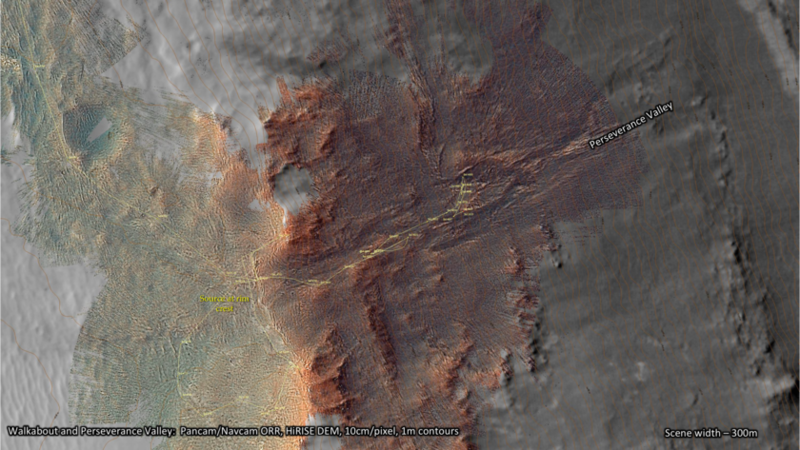 Like a fracture or alteration zone, this linear feature cuts through the impact breccias and moves downslope. “As we moved farther down the valley, it continues for some 50, 60 meters, and this feature is trending parallel to the same La Bajada feature,” he pointed out. As Opportunity drove downhill in Perseverance from station 1 to station 2 in September 2017, she drove right through this area, named La Bajada after the stop on El Camino Real de Tierra Adentro, the old, 2,560-kilometer (about 1,591-mile) trade route between Mexico City and San Juan Pueblo, NM, the team’s naming theme since entering the valley. What drew the scientists were telltale signs of erosion on the bright outcrop (right). The rover drove backed uphill to investigate. Further research by Larry Crumpler indicates La Bajada is likely a fracture or fault. When Crumpler mapped the potential fractures and faults of La Bajada based on the physical characteristics at the site, he found that a fault bounds the margins of the south trough. “That says perhaps the valley itself has actually got significant fractures or faults and is actually following the current track,” he said. After an introduction underscoring the value of the multiple working hypotheses approach the team is taking despite the understandable interest in the possibility of flowing water, Rob Sullivan focused his presentation on evidence showing the potential contributions that fracturing and aeolian or wind abrasion made in the formation of Perseverance. Sullivan's presentation began with a quick familiarization "tour" of aeolian abrasion features on Earth, including wind-altered rocks in Coachella Valley, California. “Wind-driven sand impacting rocks can completely change rock shapes by eroding away a great deal of material while applying special, diagnostic textures to rock surfaces that remain,” he said. 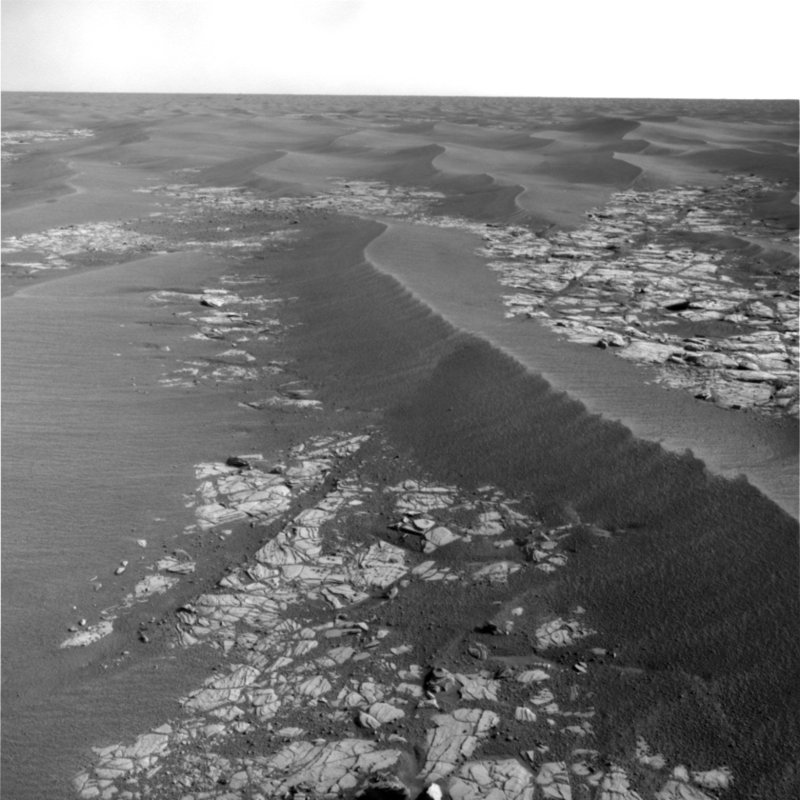 With Earth-based examples as a basis for comparison, he turned to Mars, showing examples of aeolian abrasion along Opportunity's traverse at Meridiani Planum. Beyond the pervasiveness of this process at Meridiani Planum, Sullivan’s main point was that aeolian abrasion happens fast. That’s fast geologically speaking. Well, that raises a couple of pertinent questions – and would seem to dam the flowing water hypothesis. If aeolian abrasion is that effective and this valley presumably formed in the first half of Martian history, how could it have survived looking like a river system more than two billion years to today under the onslaught of the constant winds? Alternatively, if water carved Perseverance Valley more recently – so that the trough system remained recognizable as it is today despite degradation by aeolian abrasion – is it possible that there was flowing water in just this one location, and if so, then where did that water come from? Wind-driven sand can “completely change” rock shapes in a relatively short amount of time geologically speaking, said Sullivan, as he showed images of rocks that have been shaped by aeolian abrasion during his LPSC presentation. From the Coachella Valley on Earth (left) to a crater named Fram on Mars (right), winds have visibly altered the shape and textures of rocks. Sullivan illustrated these issues withclose-up pictures of rock surfaces within Perseverance Valley that showed diagnostic aeolian abrasion textures, indicating wind-driven sand blowing up and out of the crater. “This is inconsistent with any signs for water erosion acting downhill,” he said. From Marathon Valley, another low-lying site that cuts into Endeavour’s west rim in the Cape Tribulation segment, which Opportunity explored in 2015-2016 before heading farther south along the rim to Perseverance, Sullivan showed rather dramatic examples of aeolian abrasion. The wind processes have reshaped exposed rocks there, as well as planed off most of the valley floor, which, unlike Perseverance, is not soil-covered, he noted. Interestingly, the bare rock surface of Marathon Valley's floor is marked with“a complex network of fractures at all orientations, many of them soil-filled, others not,” Sullivan pointed out. “Some of the largest fractures are oriented downslope, toward the center of the crater–these are important features for comparison with Perseverance Valley,” he added. Opportunity’s views from within Perseverance Valley reveal that the potential traces of stream [water] flow seen from orbit turn out to be rather unimpressive features of very low relief. Essentially, “these features are very shallow, soil-filled troughs between similarly low-relief outcrops,” he said, noting that these troughs share characteristics with sand-filled fractures seen elsewhere, particularly the features interpreted as fractures at Marathon Valley. Opportunity took the frames that went into this panorama with her Navcam in early March 2018. The tracks show how the rover has moved around this site, about halfway down the length of Perseverance Valley. Author and planetary outreach educator, Stuart Atkinson stitched the frames together and processed this image. A frequent image contributor to The MER Update, Atkinson also contributes to The Planetary Society’s Amateur Space Images Archive, and blogs about this rover’s journey at his The Road to Endeavour. Sullivan proposed that the shallow, interleaved trough system of Perseverance Valley might have been formed by “a network of ancient fractures and faults that reactivated after the potentially wet, warm climate of the Noachian Period, conceivably multiple times, with long hiatuses in between,” he said. “Minor surface relief resulting from each reactivation, like from any upward displacement of one block relative to another, would be followed each time by erosion and reduction of the newly-formed relief by aeolian abrasion and other weathering processes." The problem of Perseverance Valley's "singularity" remains, of course. Of all the fractures and faults caused by the impact that riddle the bedrock all through the Endeavour region, “why would only those in the area of Perseverance Valley reactivate from time to time?” Sullivan wondered. To explain the singular nature of Perseverance Valley, the team is looking for a process – perhaps faulting/fracturing, perhaps something else – that is very rare, “but yet not entirely absent,” Sullivan said as he clicked to one of the final slides of his presentation. Opportunity took this image on Sol 1784 more than 3200 sols or Martian days ago with her Navigation Camera (Navcam). It shows a fracture that apparently reactivated recently enough to offset a large wind ripple, leaving the two sides misaligned. "Displacement fault activation does occur, very rarely,” Sullivan concluded. While this observation seems promising, Sullivan did not seem entirely convinced. “Opportunity is only half-way down Perseverance Valley, with many more observations to make,” he reminded the audience. "NO conclusions about PV origin yet. Multiple working hypotheses!! Collect more data." Tim Parker has been following the water, or at least doing everything possible to find evidence for flowing water in Perseverance Valley’s past. Matching high-resolution orbiter views with projections of images Opportunity has taken on the ground, he presented his show-and-tell visual analyses conjecturing how this unique geological feature could have been formed by a short-lived flood that spilled over from an ancient lake to the west of the crater rim. Timothy Parker, MER Athena Science Team member, of JPL, (left) has been a part of the MER mission since the beginning and, like a number of other MERsters, also does double duty on Curiosity. After years of anticipation, Opportunity finally drove over the edge of the Endeavour Crater rim pictured above (right) and into Perseverance Valley in July 2017. This view was processed by the Pancam team in false color. If Perseverance Valley does represent a short-lived flood from a lake source, it would not necessarily require precipitation to form, Parker noted. “This might also provide an explanation as to why there aren’t other channels elsewhere at Endeavour.” If not a short-lived flood, then it could be, “something more like an ephemeral stream,” with a modest discharge channel,” he suggested. Since the channel begins at the rim crest, “the source is likely surface ponding,” Parker continued. That ponding would likely be to the west, in the area atop the valley, where Opportunity conducted a walkabout. The water would have flowed “from this proposed lake into Perseverance” at the notch in the topography, “which is only about a meter deep and right at the head of the valley,” he said. “The plains west of Perseverance (left side in both images) correspond to a shallow embayment, but not a closed depression,” said Parker as he presented his lake spillover theory at LPSC. “If you flood the terrain to an elevation of -1455.15 meters, you get a connection between the interior and the exterior of the crater right at the proposed notch, but the plains are open to the west.Tilting the topography between .5 and .8 degrees to the east, however, produces a 2-meter deep closed depression,” he said. With issues to resolve and more ‘road’ to put in the rear view mirror, Parker is hoping for “more glorious detail,” as Opportunity roves on. “If you flood the terrain in our HiRISE DEM map to an elevation of -1455.15 meters, you get a connection between the interior and the exterior of the crater right at the proposed notch,” Parker showed with a visual. “But the depression here isn’t closed, so the plains are open to the west,” he said. Alternatively, he added, “an ice sheet west of the crater rim could have also closed the embayment.” Still, there are issues to resolve. Did a lake spill into it? Tim Parker put “a really hard stretch” on the NavCam and Pancam orthomosaics over the HiRISE digital elevation model that make up this image so you can see the Perseverance Valley in fine detail. “That looks like a channel to me,” he said. Parker’s hope now is pretty much the same as the other scientists’ hope – that Opportunity finds “more glorious detail” as the mission heads farther down the valley. Madison Hughes took the conference audience way back, to the Noachian Period some 4.2 to 3.7 billion years ago and more specifically to the time shortly after the big impact that created Endeavour Crater. Using a landscape evolution model known as MARSSIM,she investigated the degradational history of this 22-kilometer (13.7-mile) diameter crater to get an overview of how this crater has “aged” over the last few billion years. Madison Hughes, a PhD candidate at Washington University St. Louis, (right) used a landscape evolution model known as MARSSIM to investigate the degradational history of Endeavour Crater to see how it has “aged” over the last two billion years or so. 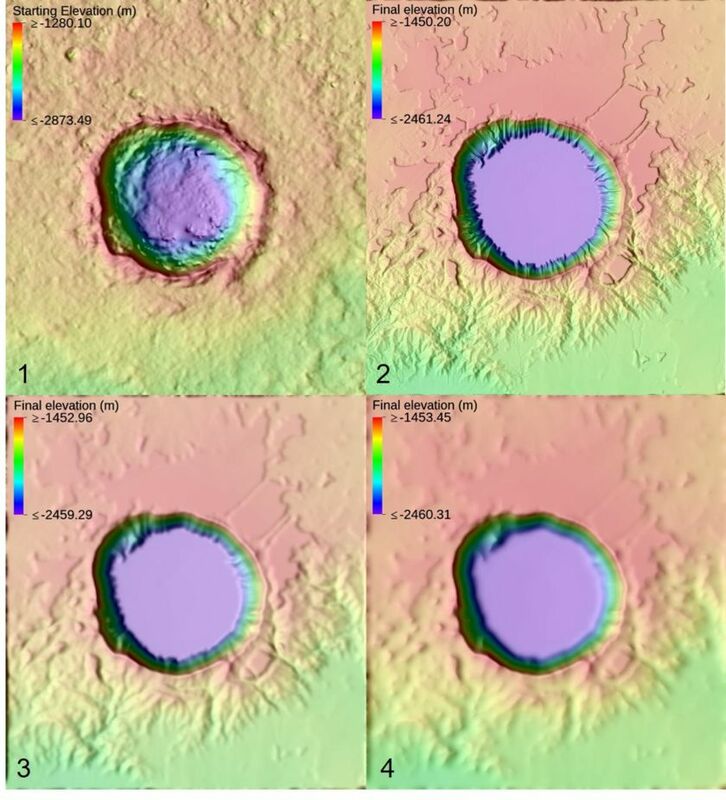 She chose the nearby, fresh-looking Bopolu Crater, because of its similar diameter, younger age, and relatively fresh appearance as an analog for Endeavour and ran what turned out to be hundreds of simulations. The image of the craters (left) was taken by THEMIS, the thermal emission imaging system, onboard Mars Odyssey. Hughes wanted to find out how erosional processes on Mars have changed since those bombardment days of the Noachian and how they have shaped the geomorphology of Endeavour – and what all that has to implyabout the environmental conditions that have been in play in Meridiani Planum throughout the last few billion years. Noachian: 4.1 to 3.7 billion years ago. Since arriving at Endeavour, Opportunity has generally been roving around in the ancient surfaces of this period, whenthe oldest extant surfaces of Marswere formed. Asteroids, meteors, and comets regularly pummeled the planet, and liquid water produced river valley networks, lakes, perhaps an ocean, and extensively eroded everything. Hesperian: 3.7 to 3.0 billion years ago. Defined by the formation of extensive lava plains and catastrophic releases of water that carved extensive outflow channels around Chryse Planitia and elsewhere, this time period also harbored lakes and/or seas in the northern lowlands. Amazonian: 3.0 billion years ago to present. Characterized by low rates of meteorite and asteroid impacts, the planet evolved during this period to feature cold, hyperarid conditions essentially similar to those on Mars today. Studies of impact crater densities on the Martian surface have defined three major periods in the Mars’ geologic history: Noachian; Hesperian; and Amazonian. The absolute ages shown here are only approximate. For the simulation, Hughes used the nearby, fresh-looking Bopolu Crater, because of its similar diameter, younger age, and relatively fresh appearance as an analog for Endeavour. With a diameter of 19 kilometers, Bopolu, scientists believe, formed sometime after the Burns Formation buried much of Endeavour. She input elevation and other pertinent topographical data of Bopolu into the MARSSIM model and began running the simulations. Endeavour’s still-exposed rim segments provided Hughes with constraints as to what the final crater morphology should look like, including such defining aspects as the slope of the crater rim and the final thickness of regolith present on the rim. With MARSSIM, software developed by Alan Howard of the University of Virginia, a co-author of the work, Hughes was able to “tweak the parameters” asa function of time in a series of forward models. Matching what is already known about past environments and their timeframes in Meridiani Planum,she simulateddifferent erosional environmentsto advance the research. After running the fluvial version of the model, she took the output and input it into a more hyper-arid environment, and then took the output from that and ran it through the aeolian evolution model.“I’m trying to create a certain morphology, so basically doing I am running hundreds of models to get the environment that produces what Endeavour looks like now,” Hughes said. From her simulations with the landscape evolution model MARSSIM, Hughes was able to conclude that the morphology of Endeavour was likely produced during an initial period of fluvial or water erosion in a semi-arid to arid (dry) environment. This was followed by a drier period of erosion without water that was dominated by lower rates of weathering, diffusion, and mass-wasting, also known as slope movement or mass movement, and finally a period dominated by aeolian erosion and deposition that continues to this day. Hughes then modeled the subsequent period dominated by aeolian erosion and deposition that continues to this day. “This smoothed out the rim further, and deposited aeolian sediment in the interior of the crater,” she said. 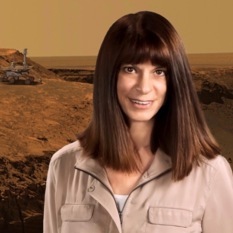 The plan forward, Hughes said, is to continue this research to better understand the degradational history that shaped Endeavour Crater and determine the implications for paleoclimatic conditions. “I want to model the deposition of the Burns Formation and the subsequent backwasting and erosion of the rim to try to create a final morphology that is even closer to how Endeavour is expressed today,” she said. Michael Bouchard searched for clues to the origin of Perseverance by comparing the composition of rocks within the valley to other rock suites observed along the rim of Endeavor Crater. He found an intriguing similarity between the Perseverance rocks and rocks Opportunity previously studied inside Spirit of St. Louis, the small, approximately 30-meter crater located to the north, at the head of Marathon Valley, which Opportunity studied in May 2015. Michael Bouchard, a PhD candidate and NASA Earth and Space Science Fellow at Washington University St. Louis (pictured on Earth left) searched for clues to the origin of Perseverance by comparing the composition of rocks within the valley to other rock suites observed along the rim of Endeavor Crater. Among the most intriguing rocks found to date in Perseverance are the Nueva Vizcaya type (right), which are scoured and eroded probably by wind-blown sand. Using data that Opportunity gathered with her chemical detecting Alpha Particle X-ray Spectrometer (APXS) along with close up Microscopic Imager (MI) pictures and color images the robot took with her stereo color Pancam, Bouchard compared the rocks of the two sites using fairly standard rock identification tools. These tools included a hierarchical cluster analysis, an error-weighted reduced-chi-squared similarity index, which is a kind of regression tool to detect the geochemistry, and a multi-component mixing model. For this research, Bouchard got inventive and modified and adapted the standard chi-squared index, creating a special, first of its kind “similarity index.” His combination of these two techniques with informed image analysis into a multi-prong statistical grouping model is novel and served the research well. From Perseverance, Bouchard took Opportunity’s APXS/MI results on Zacatecas (Sol 4787), Albuquerque (Sol 4854), Durango (Sol 4916), Carrizal (Sol 4943), Parral (Sol 4794), Mesilla (Sol 4895), and Bernalillo (Sol 4861, 4865) and compared them to data on more than 150 rock targets the rover had analyzed with the APXS elsewhere on the crater rim. Of all those, four – Donald A. Hall (Sol 4023), Harold M. Bixby (Sol 4013), Lambert Field (Sol 4003) inside Spirit of St. Louis (SOSL) Crater, and Roosevelt Field from Lindbergh Mound (Sol 4009) – “jumped out as highly similar,” Bouchard said. From those comparisons, Bouchard found the rocks in Perseverance to by and large be “members of Endeavour Crater impact breccia” or Shoemaker Formation, although he found the Parral and Mesilla cobbles had distinctly different compositions when compared to the rest of the Perseverance rocks. Turns out, Parral is “highly similar” to the Matijevic Formation targets Fullerton and Azilda. While Parral does not contain any of the “newberry” concretions, Bouchard noted, “it does contain resistant angular clasts,” which one would expect to find if it were an impact breccia like the Shoemaker Formation. An important and useful result of Bouchard’s innovative multi-prong statistical grouping model is that the rocks Opportunity has studied at nine sites with the APXS/MI science protocol can be grouped, based on composition and texture similarities, into four lithochemical groupings: 1) Perseverance Valley Floor material, classic rubbly floor material of the valley; 2) “Shoemaker like” cobbles, rubble that has composition similar but not exactly like the Shoemaker Formation; 3) Blue Cobbles/Outcrops; and 4) Nueva Vizcaya type outcrop. “In addition to being similar to Matijevic Formation, the Parral cobble is also similar to a class of ‘blue’ rocks we’ve seen along the rim of Endeavour crater,” he said. 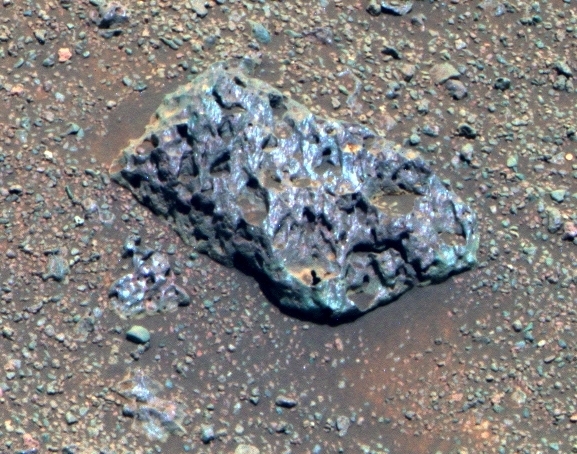 [These rocks appear blue in false color composite Pancam images.] “They could be impact melt, but I suggest in other work that they are volcanic rocks that both pre-date and post-date the Endeavor Crater impact. The interpretation of these Perseverance cobbles as blue rocks was strengthened when we found an entire outcrop of blue rocks (San Miguel) in Perseverance,” Bouchard noted later. Parral and Mesilla, he suggested, “may represent an allochthonous population of cobbles that have been deposited in Perseverance.” In other words, these cobbles probably came from someplace else, “most likely somewhere up-valley,” Bouchard said, “and then were transported downhill by some mechanism, like gravity, water, or wind.” Interestingly, mixing models of the Perseverance floor rocks (Zacatecas, Albuquerque, Carrizal, Durango) show that this type of “blue cobble” (Parral) makes up “an estimated 25% the valley fill material,” he added. 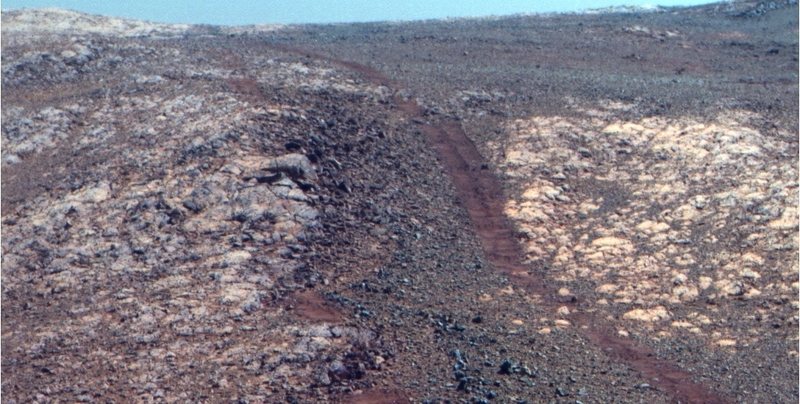 Bouchard found the rocks in Perseverance to mostly be “members of Endeavour Crater impact breccia” or Shoemaker Formation. But he did find that the Parral and Mesilla cobbles had distinctly different compositions when compared to the rest of the valley rocks. Turns out, Parral is “highly similar” to the Matijevic Formation targets Fullerton and Azilda, he said, but without any newberries. Parral and Mesilla, he suggested, may have come from someplace else, “most likely somewhere up-valley,” and then were transported by an as yet unknown mechanism to their current sites. There is every good reason to do that now. “One of the hypotheses for the origin of the valley is that weakening along Endeavour crater radial fractures might have made Perseverance Valley a favorable location for downslope mass wasting, or erosion by ice, or flowing/seeping water, however supplied,” he pointed out. “The fact that we see evidence of alteration along such fractures and the similarity of compositions of Perseverance materials to those within Spirit of St. Louis Crater perhaps points to a similar post-Endeavour crater processing or sourcing of materials, yet to be discovered by ongoing exploration of the valley and its bedrock by the Opportunity rover,” said Bouchard in closing. The second part of the Mars Rover Results in Depositional and Environmental History took place in the Poster Session just a couple of hours following the talks. There, Opportunity’s science and engineering featured in three poster presentations. Ray Arvidson was on hand to discuss Hill Driving with the Opportunity and Curiosity Mars Rovers, an abstract and poster he produced with MER/MSL RP Paolo Bellutta and othersto investigate the rovers’ mobility limits associated with hill driving. 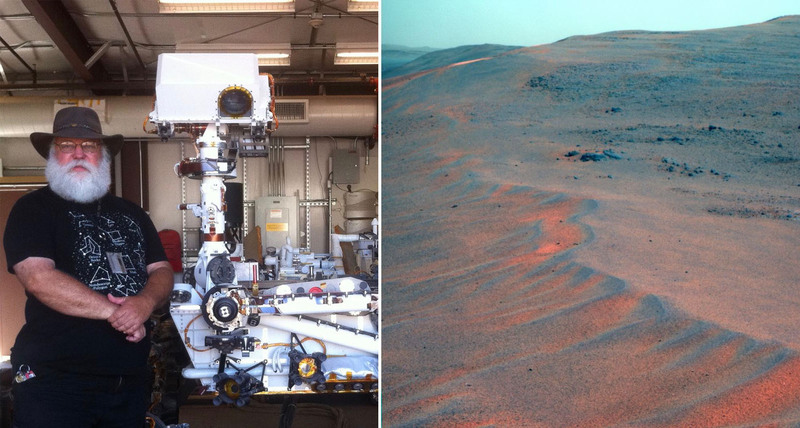 Although neither Opportunity nor Curiosity, which share the same rocker bogie drive system, were designed to hike Martian mountains, drive up steep, gravelly slopes, or dive into craters, each is effectively being used as a virtual instrument to retrieve geomorphic and surface properties. When one of the rovers is negotiating a path up hill, terrain type makes a big difference obviously. Everyone agrees that sand or a surface slick with pebbles should be avoided. But, the primary take-home lesson learned? That depends on who you ask. Deputy Principal Investigator Ray Arvidson of Washington University St. Louis (left) was on hand at LPSC to discuss his poster presentation. The take-home message from lessons learned on the Martian road with Opportunity and Curiosity? “Don’t drive up steep hills,” he said. Rover Planner Paolo Bellutta, a co-author, respectfully disagreed: “descending is more hair-raising for me.” Opportunity couldn’t quite make it up to the chosen outcrop at the top of Knudsen Ridge in Marathon Valley (right), and wound up having to, very carefully, back down. “Don’t drive up steep hills,” said Arvidson. Another major exploration hazard on Mars is dust, because it’s everywhere. It blankets the landscape and covers just about every rock with an exterior veneer or coating. N.J. Bradley and colleagues from Brock University in Ontario, Canada, studied the MI pictures of a selection of rocks, both ‘as is’ and brushed with the RAT, analyzed the dust coverage, and then compared their dust coverage values to the rover’s APXS data. The goal: to see if they could use this approach as a method to constrain bedrock composition. With the caveat that each image “must be examined individually to assess variations in lighting, shadows, and bedrock type,” the result showed “good agreement” between their dust coverage analyses and APXS determined elemental concentrations. The finding, Bradley and his colleagues concluded, “lends confidence” to this approach to gauging bedrock composition. As the scientists packed up and headed home and back to their routines, Opportunity pulled up to that long line of vesicular rocks on the floor of the valley in the south trough. During the last couple of weeks, the scientists have been scrutinizing the latest little bounty from Mars. As for the glassy, vesiculated rocks? They may be volcanic impact melt or a new class of Martian rocks, or not. Analysis is. With the stone stripes now viewed as notperiglacialproducts,that all but knocks ice off the multiple working hypotheses list, for the moment anyway. The stripes do not point directly downhill and Mellon’s thermal modeling didn’t support the ice it would take to create these geological features as they occur on Earth. While scientists, professors, and students from around the world gathered at LPSC in Texas to offer up and take in the latest research in planetary and lunar research, Opportunity was approaching a group of vesicular rocks. They could be impact melt, rocks that were instantaneously melted by the high pressures and temperatures created when the asteroid or comet that created Endeavour hit. Or they could be another new type of Martian rock. The science team’s investigation is underway. As for deposits or signs of flowing water? Elusive. The lack of evidence for any kind of ancient sea walls or acatchment to the west, the fact that the area atop Perseverance tilts away from the rim crest to the west, and the reality that the compaction models don’t support the necessary tilting to close in a lake on the western side are “too much” for some of the scientists on the team to favor the lake spill-over theory. At the same time, Golombek noted: “So far, Tim’s data and analysis is the strongest evidence that there could have been water that spilled over the edge and carved this channel.” That doesn’t mean it was water, “it’s just consistent with water finding the low point and going downhill,” he said. The water theory getting some weight these days seems to be rising up from the Martian ground. If underground waters moved along the fractures, they could have carved Perseverance, and then as a result of the winds sweeping up and out of the crater and preferentially eroding along fractures, the valley may have been shaped over the millennia into its current morphology. “Surely wind could shape a minor feature like Perseverance, working its way along fractures and irregular outcrops, making what appears to be the remnants of a fluvial system,” said Arvidson. With Opportunity’s cumulative data from Perseverance, and the research efforts of members of the science team, the thinking of the momentis that this unique formation is very much fault controlled; that the outcrops have been significantly shaped by wind; and that regolith has filled in the low areas. Opportunity used her Pancam to take a number of raw pictures of her view into Perseverance Valley in May 2017 that Seán Doran, an artistic director, processed into this image. From here, the rover drove straight ahead and into the valley to explore it from top to bottom. Could the winds sweeping up and out of the crater over the millennia have smoothed and shaped this valley into its current morphology? For more of Doran’s work, see The Planetary Society’s image archives; Twitter; and Flickr. That would date the valley’s formation to late Noachian, early Hesperian. Or two to three billion years ago. Give or take a billion years, the undeniable thing is Perseverance looks like it was carved by water. It just looks like a channel where water once flowed, like a river system. Have you ever heard of ‘equifinality?’” asked Arvidson. What we do know now though sets the stage for Opportunity’s next discoveries. And those findings, whatever they may be, all but promise that this veteran robot hero will make another appearance in the spotlight at the 50th annual LPSC next year. Thanks for a great science update! I'm sorry it to so long to get read. That was a lot to soak up! You are doing really great with your coverage of this mission! Thank you for this effort you apply in covering this mission!